If you’re using the charger that came in the box with your iPhone, you’re really missing out. Why? Because Apple only includes a cheap, low-output charger with its iPhones. You could be charging up your phone twice as fast with a better adapter. And what about wireless charging? Or what if you’re in the car? Let’s take a look at three chargers every iPhone user should own. 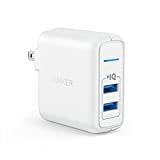 The Anker Elite USB Charger dual-port wall adapter support fast charging up to 24W and it has a great foldable design so it’s easy to take with you anywhere. This charger is well-made and sturdy, and it’s also quite affordable. It’s no wonder that this is one of the most popular options out there. AUKEY’s Mini Car Charger packs two USB ports in a wonderfully compact design. It also supports 24W/2.4A fast charging so your iPhone will soak up as much power as possible while you drive to your destination. It’s one of the best car chargers on the market and it constantly gets rave reviews from users. Wireless charging is one of the most convenient features that has been added to smartphones in recent years. In fact, it’s difficult to imagine going back to wires once you get used to simply dropping your phone onto a wireless charger to refuel it. The Anker PowerWave Fast Wireless Charger Stand offers the best balance of features and price, and it supports fast wireless charging for iPhone models and Android phones alike. You can also charge your phone in portrait or landscape thanks to the dual-coil configuration. Loopilops Braided Lightning Cable (5-Pack). Apart from chargers, you’re also going to need some good Lightning cables. This 5-pack comes with three different lengths. CableCreation Lightning/microUSB Combo Cable. If you want a cable that will charge your iPhone and your other devices, this combo cable is just what the doctor ordered. Anker PowerCore 10000. You can’t talk about chargers without covering portable chargers, and this Anker power pack has more than enough juice to charge your iPhone more than four times on the go. Ailkin USB Wall Charger (2-Pack). These little chargers are about the size of the standard iPhone wall adapter, but they each have two USB connections instead of one. Kedron Portable Wireless Charger. Kedron’s portable power pack has a whopping 24,000 mAh, but the real kicker here is a built-in wireless charging pad.